1) (11/19/2018) First update on Dash central containing the first full report on our project and more. ﻿1. A new decentralized method to viralize DASH as the #1 cryptocurrency in Venezuela as a standard method of payment, thanks to our weekly DASH-trivia and our Active-Agents promotion system. A major step towards making Venezuela the first DASH nation. 2. A new mobile and web app “DASH-On” to educate communities through the Active Agents program and the masses with our DASH-Trivia. 3. Adding 3,000+ well informed and active users. Sharing attractive content about DASH in their social media and organizing local events to promote DASH. 4. 2,500+ manually verified new DASH wallets, downloaded due to the users of our platform. 5. A massive user-based advertising strategy along with 5000 DASH informative posts in the social media of our platform members, for a viral reach. 6. 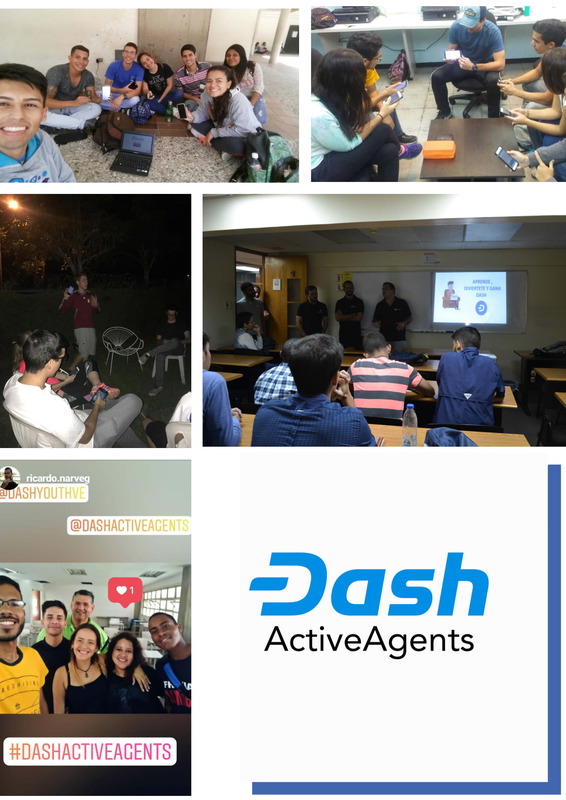 To promote the creation of DASH networks from users within Venezuelan communities thanks to our “Active Agents Program”. 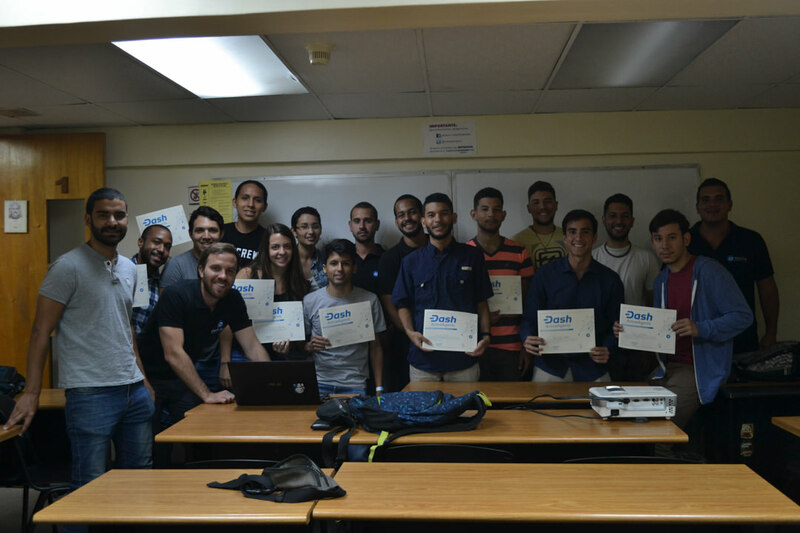 ﻿DASH-Youth Venezuela (led by santos_br) in order to provide basic training in DASH use and supplemental materials for the Active Agents. ﻿DASH Help Support Center (led by AlejandroE) in order to provide assistance to our users. ﻿DASH-Merchants (led by AlejandroE &amp; andrade92) in order to advertise different merchants that accept DASH through our platform and events. ﻿DASH-Text (led LorenzoReyC) in order to promote SMS technology as a new method of payment within communities that lack the resources to adopt DASH as method of payment. ﻿Further DASH initiatives active in Venezuela and funded by the DASH treasury. The DASH Active Agents team would like to introduce a new decentralized way of making DASH viral and present our online platform, DASH-ON, to the DASH community. Our goal is to create a community of 500+ new informed and active DASH promoters, actively organizing talks and lectures about DASH in their communities. The goal of this proposal is to have these promoters organize 500+ local DASH talks, engaging 5-10 people each. Furthermore, our online platform will provide each user with the opportunity to participate in weekly trivia contests to engage general populations in the DASH movement. We hope you like this proposal, feel free to let us know what you think. 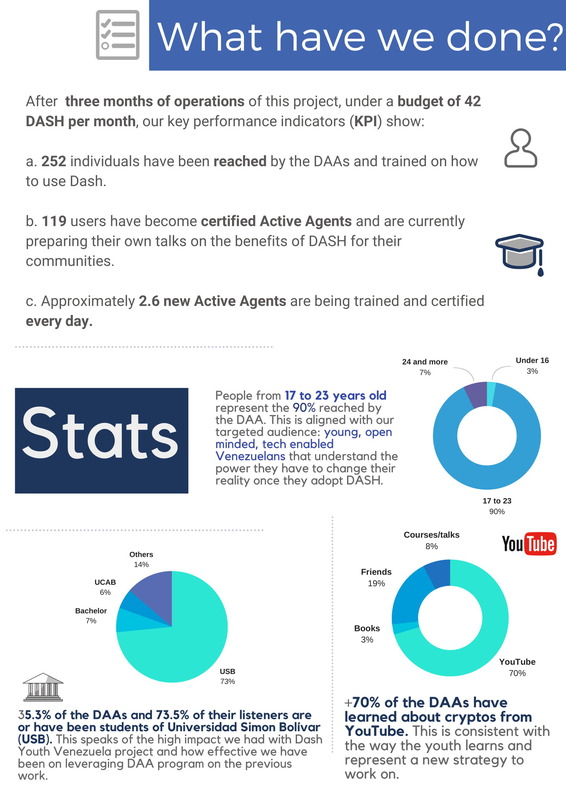 The Dash Active Agent program is an education-based marketing initiative focused on training people on Dash benefits and functionality. 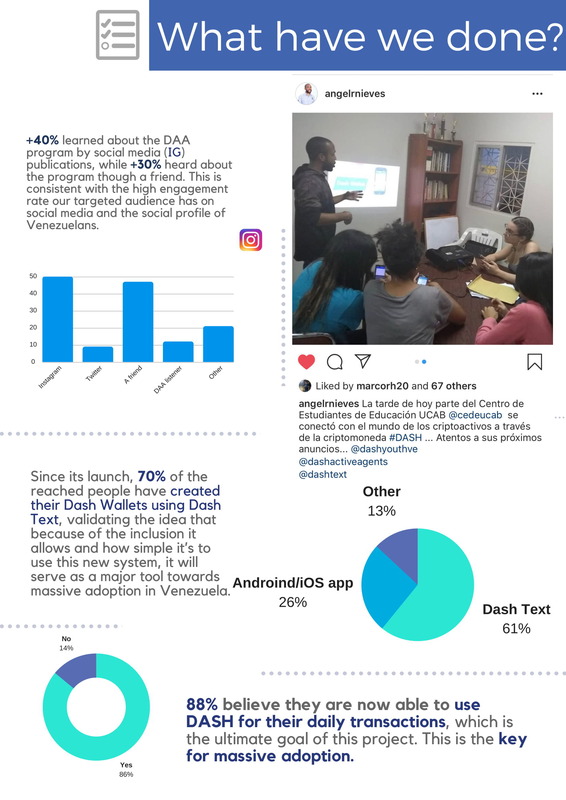 As part of this project, well informed and active DASH-users in Venezuela will be trained to organize local events talks that engage their communities and social circles in the Venezuelan DASH movement. The goal of this initiative is to create a network of these active DASH promoters over Venezuela, and reward them by their achievements (paying them in DASH based on how spread is their promotion). By spreading the word about DASH in an user-based fashion, communities will we encouraged to speed-up the adoption process by merchants and customers, leading a significant growth on the use of DASH as a day to day resource. ﻿1. 252 individuals reached and trained by the Active Agents. 2. 119 Users have become certified Active Agents and are currently preparing their own talks on the benefits of DASH for their communities. 3. Approximately 2.6 new Active Agents are being trained and certified every day. 1. 500 fully trained and certified Active Agents. 2. 2500+ individuals educated on the use and benefits of DASH through active agents talks. 3. An online platform for the report of Active Agents advances and validation of their promotion. 4. 12 massive weekly trivia contests about DASH and cryptocurrencies, held through our platform, where winning contestants will be rewarded with DASH. 2. Active Agent talks will reach 1000 users by early January and 2500 by late February. 3. Our full online platform and application will be released to the public before late December (allowing for 12+ weekly ﻿trivia). ﻿The Universidad Simon Bolivar as a study case as a viable Dash friendly ecosystem and the possibilities that presents. 1. Engagement of Active Agents countrywide (so far we have only trained users in Caracas) through developing our online . ﻿2. Validation of the advances of each of our Active Agents. Please leave your feedback in the comment section! I am formally withdrawing my support for this project. The reason for this is that I learned that the most of the team are full time students that do not have the time to devote full time to make this project a success. The team have been late on providing results and during the delay on getting results the DASH price has crashed which means that now the team will not be able to achieve the same results with the money left. I had made several appointments with Santos to discuss the projects but on most occasions he did not make the appointment. For me, reliability is an essential part of a successful project because it is an indication of if someone is committed. I spent many hours helping to design the DASH Active Agents program and if it had been implemented the way it was supposed to have been then I am sure the program would be a great success. However, the program would have needed complete commitment by the team to make it work and since they are full time students it became clear to me that they cannot afford the time to make this project successful in my opinion. I feel passionately about the Venezuela projects however I will only support the one's were I feel that they will be successful. I personally do not feel this project will be successful with the amount of time currently being spent on this project. I feel particularly bad about stating this because I had put in a lot of my own time giving feedback and helping to design this viral marketing program. I also personally like the team members. If I had know about the students time commitments however I would not have given my backing to the project because it takes all team members working full time to make this work. I have therefore, reluctantly changed by vote from YES to NO. santos--re: <I had made several appointments with Santos to discuss the projects but on most occasions he did not make the appointment.> Were you experiencing physical illness for example and could not function at a normal level to make the appointments? Hello telegon_heights. Each time I was not able to attend a agreed meeting a detailed explanation was given to DeepBlue, with due apologies but he did not found those explanations satisfactory. We will not issue more statements on this matter since we do not wish to incur in a "who said what" situation. We are sorry for this misunderstanding and the lack of communications with DeepBlue despite his key external advisory role but we want the community to rest assure we are on track to reach our goals. Regarding you earlier question, we have almost reached the new 1000 created wallet KPI! We are very excited since this represents 30% of our goal. Any other question please let us know! Hello DB, we are sorry you feel this way about the team and took this decision about the program. We really appreciate your important contributions, ideas and time you spent as external adviser helping us to do the best to improve the DAA project. We took into account all your appreciations to boost up the program since it was very difficult at the beginning not only to start working, but for all the procedures and processes it takes to validate every formed person in the program. We would like to clarify to you and to the community that our team has post-graduate students and full time works. This is NOT limitative to dedicate time to the DAA project and to the enthusiasm we have to keep working for the massive adoption of Dash. We want to ensure the community all the efforts necessary for the program to be a success are being done. We are committed to finish the project in the possible way with the structure we have build in the last few months and the well managed capital we received from the Dash treasury, to prevent these type of things with the price of the Dash and to not compromise the project's viability through time. We promised and we will deliver. 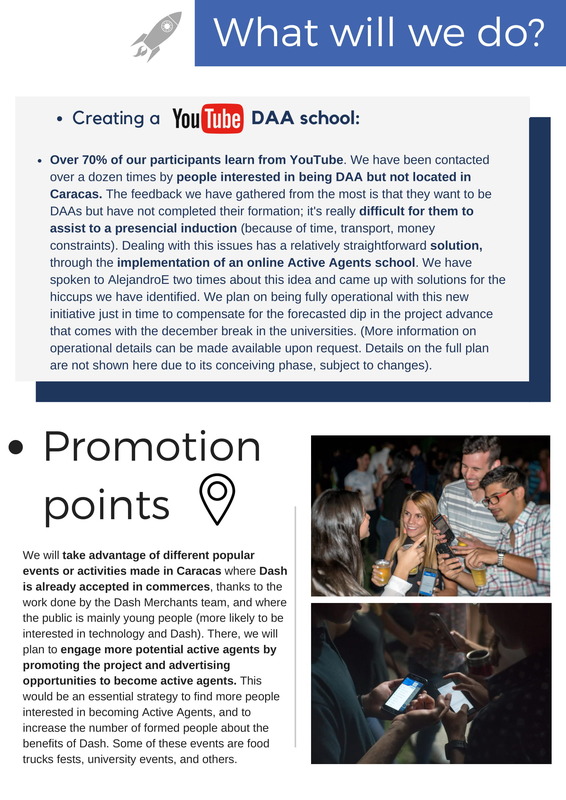 We have always responded to the community, both with the DAA program and our Dash Youth initiative (the first stage was succesfully completed eariler this year) regarding any comment, question, and providing results about our projects. We notified our delays to Dash Watch two months ago we will extend our work through MARCH 2019 since we realized the logistic obstacles because of the difficult country's situation in social technological and economical matters. As we commented before, we will be posting weekly results with numbers, with some other activities we are organizing to boost our reach. how come new wallets KPI is missing from report? Sorry Teletón heights. We will include in our next report! Also, we are preparing more comprehensive reports including videos and data from our project starting at the end of november. 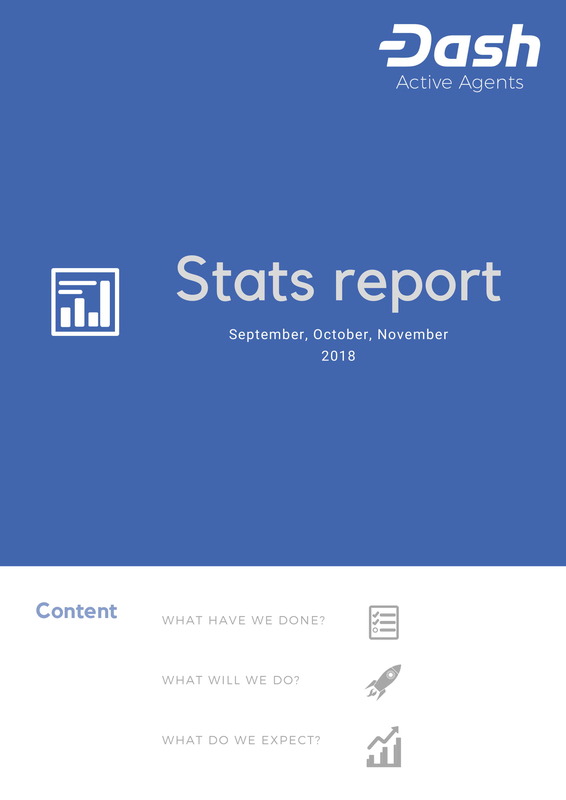 We will be publishing those reports in the forum, dashcentral and other platforms such as discord in order to increase the engagement of the community. voting YES. The proposal amount seems modest enough. This project is worth a shot. Will the promoters actually be passionate about Dash?...I hope so. Hey guys, congratulations for this idea and such a well made proposal. This program seems to be the next step for the Dash adoption in Venezuela, it will be massive since the incentives will make it viral. So I guess it would be an easy yes for MNOs. Besides, this program make the promotion in a descentralized way, so it can't be shut down, it would last forever if this team make a great job. - Dash Help Support Center: when it comes about money and new technologies, people will need help and will have tech issues. Dash Help is to solve that. - Dash Merchant Venezuela: we have affiliated over 800 merchants already, and people must know where they can spend their Dash. - Dash Remittances: both, Venezuelans living overseas and Venezuelans living in Venezuela, need to know how easy and fast is to remit money using Dash! All these points will help to close the loop in terms of adoption. Remember that. Finally, this team has demostrated to be capable of doing BIG things, the Dash Youth proposal was a success! I was lucky to work with them in many events and conferences. You guys should also submit a continuation of that proposal. Best of luck and count with the support from Dash Help, Dash Merchant and Dash Text. Hello Alejandro! Thank you for your comment. It's very insightful and it gives me the opportunity to clarify some key points of our proposal. We do believe promotion will be viral since it will je decentralized and direct between the Active Agents. But, what will really set this apart and take DASH to the next level in our country is that we won't be just promoting it. As you pointed out, there are currently many great initiatives that are actually life changing tools if people knew they existed and how to use them. Over 10% (3+ millions) of our population has migrated looking for better future, but most of them still have family here and they send money either by an illegal way because of the exchange control (really risky given the government we have) or with really complicated and shady institutions. Just imagine if everyone knew about DASH remittance. That would be a major game changer. The same could be said for all of people doubts and the assistance of DASH Help, the solution to our cash problems with DASH Text or how Merchants could thrive if the started accepting DASH. The problem is we are not getting to people as fast as we could. Once we make them see that with the tools at their disposal everybody is more than capable to take part, no matter how little your contribution, in changing of our country's economy with DASH, we will achieve massive adoption. That's what we are aiming for with our education and viral promotiona, as you said, closing the loop. PS: We are working on the DASH Youth II stage proposal, we just have to wait until summer is over and the youth gets back to school around October. I want to encourage all MNO's to log in every month to deny all the wasteful POS projects. I'd rather burn the treasury funds than continue to donate it to projects that spend it out on exchanges for all their expenses. Hello Stone, we are sorry you feel this way about our project. Hopefully, you can contact me on the dash.org forum or Discord if you want to further discuss this allegations. This appears like it could become a sort of an Amway MLM style jobs program. What is the argument against this being an army of paid shills as opposed to a more organic network of sincere enthusiasts? @billjoeallen. Thank you for your question. I think this type of question demonstrates how little some MNOs know about the situation in Venezuela. Comparing highly motivated students who passionately want to make a difference to solve the currency crisis in Venezuela and comparing that to a MLM group of shrills selling unwanted products for their own profits simply does not make any sense. There is a critical problem in Venezuela that needs to be solved. People are experiencing their savings and livelyhoods wiped out. Imagine going to your bank and finding that each month your money is worth less than half of its value from the previous month. Now imagine that happening month, month on month with you absolutely powerless to stop it. You worked all your life to save that money and now it is disappearing before your eyes. Imagine waking up each day wondering where you are going to find essential food items. In Venezuela the average person has lost over 19 lbs due to hunger. This is not weight loss from being obese this is weight loss from healthy tissue. Imagine you can't buy medicines for your family. Imagine standing in queues for half a day just to buy a loaf of bread or to buy other groceries and then finding out they are rationed so you take home half of what you needed. Then the next day standing in that very same queue again. Day after Day month after month with no hope. That is until now and DASH offers that hope. I don't think you have ever experienced that type of suffering, you also don't seem to be able to empathize with that otherwise I don't think you would have posted this question. I am pleased however you did because it presents an opportunity to address such ideas. The students who want to take part in this program are passionate and have tremendous drive to make a difference and help be a part of solving this problem in Venezuela. They have the intelligence and energy to do it. They want to make a difference and this program is enabling them to make that difference. If you saw your family members suffering from loss of hope, hunger and feelings of powerlessness to do anything and you knew you had the solution to that problem wouldn't you be highly motivated to share that knowledge with your families and friends? Wouldn't you want an program that could support you and empower you to do this? There is no justified comparison to a MLM group simply because the program will be using people's homes as Venues and speaking to friends and family. We are talking about a life saving solution that can get a country back on its feet again and alleviate all of these problems for your loved ones. I don't see any comparison to what you are saying. Dash has lost 89% of it's value against USD in the last seven months. If that's better than the Bolivar, then VZ really is in trouble. Macroeconomically, VZ is in trouble largely because so much of the foreign capital invested was wasted or stolen that the supply mostly dried up. IMO you need to present a compelling case why it won't happen again with this proposal. It's true I and other investors don't have all the information on the ground, so please educate us. Is this a charity project or is it investment? What's the ROI proposition? Nobody will use something that they don't understand. People will not use something if they don't trust it because they don't understand it. Cryptocurrency has a learning curve that people need to get over in order to be in a position to understand how it can help them and to see how it works. The very first stage of enabling DASH to become established on mass is to ensure that the people understand what it is, how to use it, how it can benefit them and what to do to find and start using DASH. That is what this program is about. The ROI is informed people that are in a position then to be able to know how to use DASH, Where to get it from and to think of applications of how it can be applied within their network of people in their communities. One of the biggest mistakes I see time and time and time again that people simply just do not seem to understand. DASH is investing in large projects without first educating the end users that are going to use that product. Without this nobody is ever going to use the product. The end users must be educated first. That is why I see a problem with many of the DASH big projects e.g Alt36. They think that by integrating a payment solution into a payment provided that all of sudden all of the customers are going to start using it. Then they think if they go to a conference for legal cannabis all the dispensaries will start using it. This will simply not happen because the merchants that will be using that solution also have to be educated and also customers that will be paying will also have to be educated. It's like having a function on your calculator that you have no idea what its function is about. You would never use that function if you don't understand it even though it is sitting right in front of you on your calculator. The first stage of mass uptake must be an educated customer, and educated end user. This is what this program will achieve at a very low cost per new educated user. Thank you very much for always being so clear and straight forward with your ideas and kind words about the project and our team DeepBlue. This is really encouraging, hopefully, this proposal will do its bit and become a part in the larger picture of solving Venezuela economy crisis by making it the first DASH Nation, the table is set. Thank you for your question billyjoeallen. In contrast to a multi-level marketing project, we provide a decentralized non-escalonated process in which active agents only act under the encouragement of our board, since anyone with enough DASH knowledge can become an active agent only after going through an induction process where they will be test and start promoting DASH after being certified in our platform. One of the main pillars of this project lies in ensuring an organic network of promoters. All of the events organized by the “active agents”, which must prove literacy on DASH use and benefits, will be manually verified through videos and photographs provided by each active agent, otherwise the agent won’t be able to claim his payment. Furthermore, while event attendants will receive also a small giveaway, this doesn’t require them to join the platform or acquire DASH. Hope this answer your concerns. Thank you for your response. As an outsider, I know that the Venezuelan government encourages foreign investment as long as we never expect to get our money back. The nationalization of the oil industry is a glaring example. How do we know that the VZ government is not merely tolerating this creation of a VZ Dash community because we are pouring money in and that as soon as the net cash flow reverses direction it will be halted or taken over by the State? I do understand your concerns billyjoeallen, the truth is that this government is unpredictable. But, as Deepblue has mentioned, the two premises that keep us going is that cryptos are, as a matter of fact completely legal in Venezuela, and that they can't be stopped. Much of this work comes at personal risk because of the political situations, but we believe there's a legitimate shot at bettering our country's economy by incorporating DASH massively, so its worth it. If it can't be stopped, then why do we need to subsidize it? Every MNOs has both the right and the responsibility to take part in a process that can change many realities. We believe our proposal to be very attractive for both the DASH MNOs (please take a look at our ROIs), the already established Venezuelan DASH community, and the Venezuelan people. Hopefully, this answer your concerns. The other point is cryptocurreny is decentralized and cannot be controlled. If sufficient numbers of people start using it, and it starts improving the economy, which it already is doing according to interviews of Venezuelan merchants that are now accepting DASH, then it will be impossible for the government to stop it. That is the beauty of cryptocurrency. The people can reclaim their power for the first time in history and the governments can't stop it even if they wanted to. If DASH is bringing so much good to the nation see what happens if the government tries to shut that down! How can we be sure that the US banks purposefully crashed the entire world economy in 2008 over greed are not going to do the same again? The Venezuelan government has passed a law specifically stating that the use of all cryptocurrencies is legal in Venezuela. The only other place that has done that is Japan - and even there it is not classed as legal tender but a legal means of exchange. Hopefully, we will continue our work together towards massive adoption of DASH in Venezuela. I would like to share a little of the work that has gone on in the background to this project. I have worked with this team over a period of 3 months, and my contribution was to the DASH ACTIVE AGENTS (DAA) part of the program which I will share here. All credit for the DASHOn concept, however, must go to this team. This beautifully complements the DAA program and enhances it. This DASH ACTIVE AGENTS initiative is a viral social marketing program that we designed from the ground up to be a minimal cost with maximum return on investment to the DASH community. In Venezuela, people put a strong emphasis on social interactions to learn and be confident in any new technology. Although Venezuelans can, of course, learn from online resources their preferred means of learning is through social interaction - this occurs to a considerably higher degree than occurs in UK, Europe and the USA where we prefer to learn from more individual means e.g using online resources. This is why the conferences and the support centre are so important in Venezuela. They provide that social context which enables the people to feel confident with the technology. This team behind the DASH youth training program. Our challenge was to create a social marketing program that would work at minimal cost but with a high return on investment. We noticed that the DASH conference funding requests were not going through due to the budget constraints. Our challenge was to figure out a way to minimize costs but maximize the ROI to the DASH network. After analysing the DASH conference expenses I could see there were costs for hiring the venue, for speakers, for security, insurance, catering and staff and other miscellaneous costs. Our goal was to eliminate as many costs as possible and to distill to the essence of what we needed. 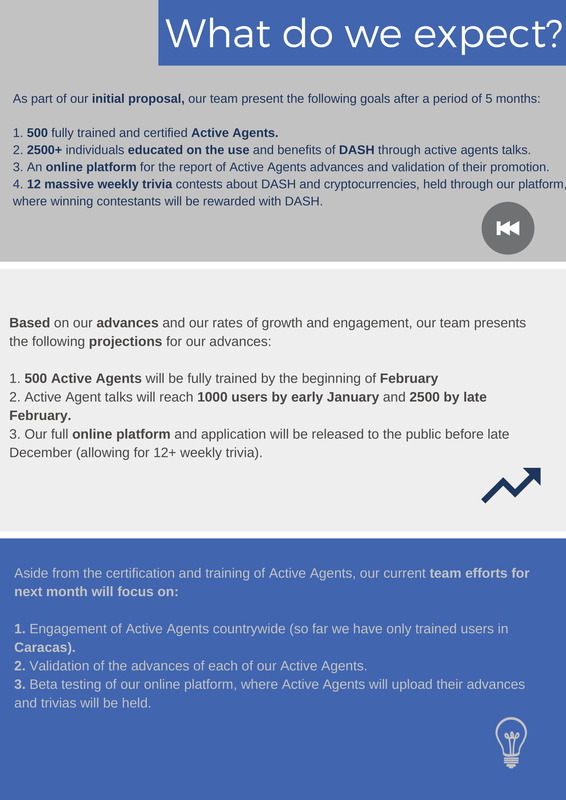 After many weeks of working on the idea, we came up with the DASH ACTIVE AGENTS program. The DAA program leverages the previous work this team has done on educating university students on DASH. The team will now go back to the universities and give training to the students on how to train others DASH Youth have in fact designed a "Train the Trainer program". The university students that want to take part in the DAA program will receive the DAA training along with a presentation package that they can use in giving their presentations to the communities. The goal is to train at least 1000 DASH ACTIVE AGENTS who will be active promoters and trainers in their communities. Once an active agent passes an exam that tests their competence they will go out and gather together their friends, family and other members of their community to a meeting which would be held in any available venue e.g. a family home, church, youth centre or club. No venue costs, no security, no catering and no staff costs are required. The DAA will train the group of people at the meeting. Each of these training programs will be manually validated by DASH youth and they will also collect evidence such as photos, emails etc from the attendees, thus building a large email database. Any of the people attending the courses themselves can opt to also become a DASH ACTIVE AGENT, and they too would then need to complete a training program and test in order to be certified. 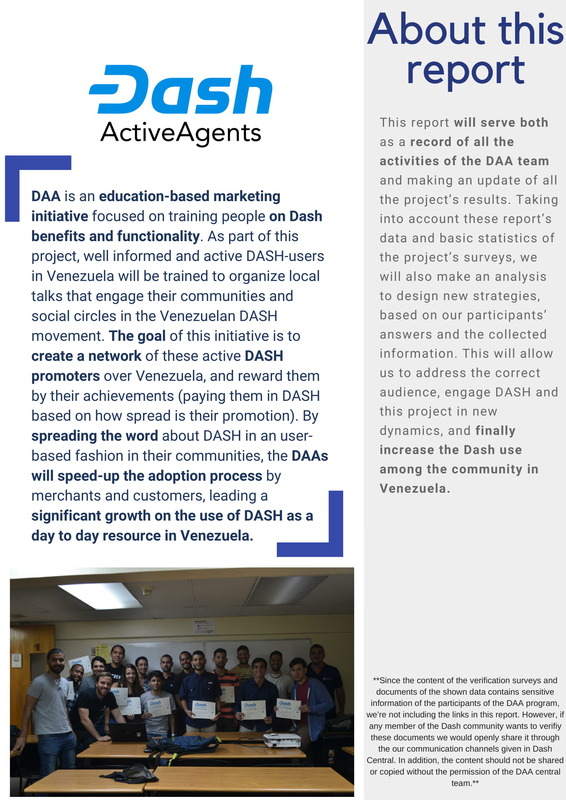 In this way, the DAA program can go viral and the word of DASH can spread rapidly through Venezuela through interactions with friends and family whilst all maintaining minimal costs. We have considered future goals to extend this social marketing program to higher levels e.g. providing an increasing scale of incentives for Active Agents that achieve greater goals e.g. encouraging celebrities to promote DASH on National TV etc. However, these higher promotional levels can only be developed after we have run this initial pilot program and learned from them. I wish this team good luck with this program and it has been a pleasure working with you to develop this program with you. As I said in your pre-proposal, I think this markedly improves over previous efforts to help users who don't know how or can't afford to obtain Dash on exchanges find a way to receive Dash for their efforts and also encourage them to help others do the same. Rather than a faucet or giveaway, this actually incentivizes users to do meaningful work on behalf of the network and rewards them based on their performance. You've made a lot of effort to improve where others have failed, and it's something I'd like to see implemented. The budget is unfortunately very tight for the time being with the market the way it is, so I would have cautioned you against submitting your proposal this cycle, however if it turns out that some of the larger proposals don't make it this cycle, I'd love for yours to be among the smaller proposals that are funded. Thank you very much for your continuous support and outstanding feedback Arthyron. Hopefully, one day more MNOs will be as dedicated and insightful as you when it comes to analyzing and contributing to form better proposals. The budget is indeed very tight, but we feel our decentralized education system and ROI give us a great shot. I would like to encourage my fellow MNOs to review the full proposal document. It is ideal. This is a professional proposal that answers all the important questions. We should consider holding all funded proposals to a similarly high standard as a minimum requirement for a 'yes' vote. Great job santos_br; you've earned my vote. We feel very proud as a team for your kind words Red. This is the fruit of the hard work from many people, including notable members of our community. Thanks for taking the taking the time to go through the full proposal document, we deeply appreciate it. Cheers! I really like the idea, because once you got the crypto bug it can take hold of you, getting (small) rewards for infecting other with you passion for Dash seem like a great addition to me. How will you get the up to speed and properly informed on Dash ? Maybe even a standardized pitch "why you should start accepting and using Dash"
To name a few. what is you go to information ? I am only asking this because there is just so much stuff going on in Dash that is hard to keep track of very thing, and keeping track of everything may proof to to much work. Thank you for your support and your questions. We truly believe that, as you mentioned, once people got the DASH virus and start spreading it among their community massive adoption will be achieved much easier. About your concerns, yes, it could be very difficult to keep and really everything that's going around the DASH ecosystem, much of our efforts will be focused to address this issue. 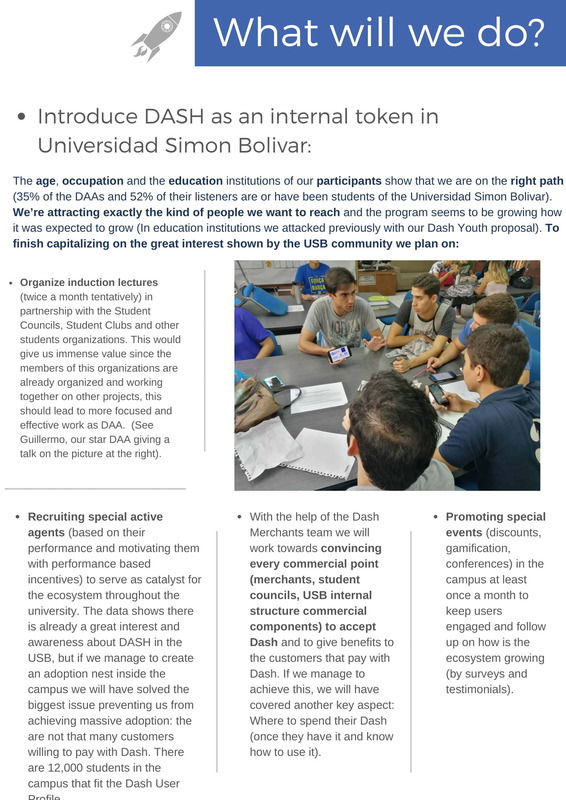 We already have a team set from the DASH YOUTH VE proposal that have taught about DASH and it's feature to over 2000+ students here in Caracas, Venezuela. This team will be acting as instructors for the Active Agents in the early stages of their development. We will teach them all the basics, benefits and how to convince others that DASH is the future of micropayments, while also showing them all of the proposals that currently exist in our country so they become integrated members of the Venezuelan DASH community and fully take advantage of all the resources the treasury has funded (DASH Help Assistance, Dash Text sms service, to name a few). We will also be providing them with tools such a standard presentation that summerize all of the information above, knowledge about the DAO, how to keep up with the different communication channels used in our community (Discord, reddit, dash.org forum) and show Dash news portals both in English and Spanish. This should be more than enough to get them started. In addition to that we will be constantly monitoring their DASH related activities in order to gather more data on how this decentralized education approach is functioning, and this communication channel will also serve as a go to method for them to channel their doubts to our team, so we can clarify them in the most efficient way. Hope these answer your concerns. Once again, thanks for your support. Cheers! I think this looks great and would really help DASH find new supporters where we need them.